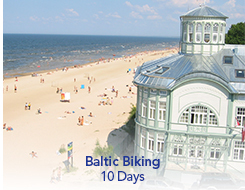 The Baltic States of Latvia, Lithuania, and Estonia offer vacationers another side of Europe with rich Gothic, Renaissance, Baroque and classical architecture. Visit Old Town, a UNESCO world heritage site in Tallinn, Estonia which dates back to the thirteenth century when a castle was built there by the crusading knights of the Teutonic Order. In Latvia, the narrow streets of Old Riga date back to medieval times. The House of Blackheads was built in Riga, Latvia in 1334, and was designed as a meeting venue for the various social organizations.